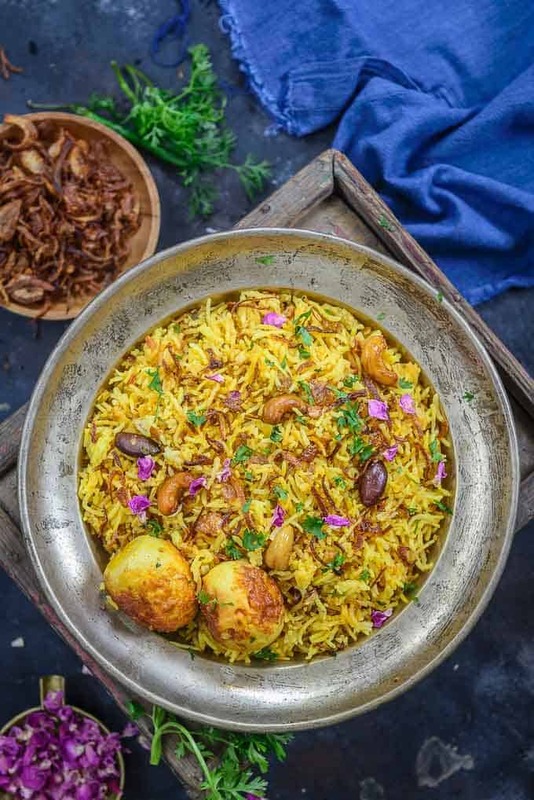 Egg Biryani or Anda Biryani is a flavorful and delicious Indian rice preparation where rice is cooked with a spicy egg layer. It is a take on Hyderabadi Gosht Biryani and is super easy to make at home. Here is how to make egg biryani recipe at home. Egg Biryani is a protein-loaded version of our all time favourite Biryani. Because of the excessive amount of work last week, the weekend meals were simple everyday fare and the kitchen was pretty boring with nothing exciting happening. With some breathing space since yesterday, I am on a cooking and baking spree and churning out dish after dish to feed the blog for a few days as I get busy with work tomorrow onwards. While I was busy cooking and shooting dishes, I came across this Egg Biryani recipe which was lying in my folder since long and I almost forgot about posting it. This delicious Egg Dum Biryani is a treasured recipe of mine. I have made it n number of times and it always turns out perfect. Don’t get intimidated by the recipe and ingredients. Though it is a little extra amount of work to make it, it’s worth all the effort. In case you like to eat more veggies with flavourful Basmati Rice then you could even try making Vegetable Dum Biryani which tastes equally scrumptious, ladies! But, for today, you should definitely note down this recipe of Egg Biryani and prepare the same at your earliest, there you go! Use best quality rice to make biryani. Use a heavy bottom pan to assemble the biryani. The biryani needs to be cooked for 40-45 minutes on low heat and if the pan is not heavy, it might burn. Always wipe the eggs before frying them. It will prevent them from spluttering. You can check the recipe to make golden fried onion here. Be very attentive while cooking the rice. Do not stir the rice much while cooking otherwise it will break the grains. 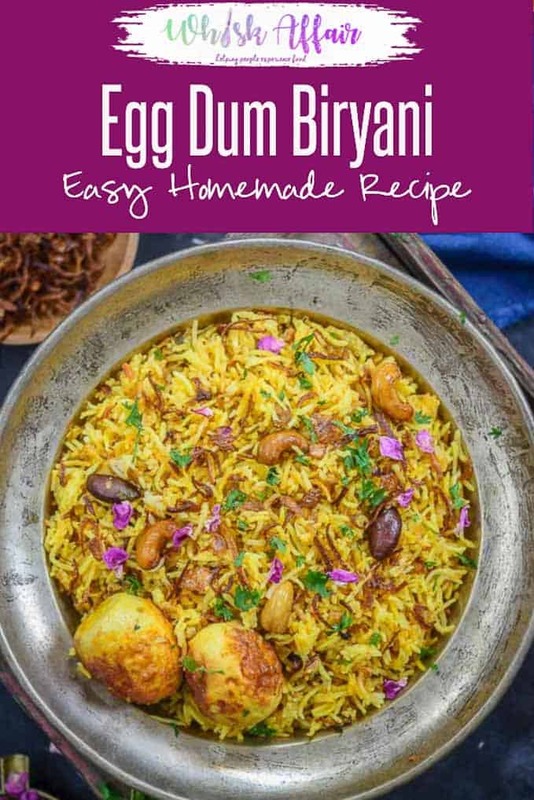 How to choose rice to make best Egg Dum Biryani Recipe? In the market, you now even get specially selected long grain Basmati Rice, which is perfect for this Biryani. 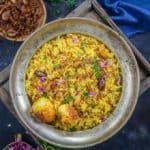 Egg Biryani or Anda Biryani is a flavorful and delicious Indian rice preparation where rice is cooked with a spicy egg layer. It is a take on Hyderabadi Gosht Biryani and is super easy to make at home. Poke the boiled eggs with a tooth pick all over and fry them till golden brown from all the sides. Be careful while frying the eggs as they splatter a lot. You can cover the pan with a lid while the eggs are frying. Add green chilies and ginger garlic paste and fry till the raw smell of ginger and garlic is gone. Add coriander powder, red chilli powder, turmeric powder, garam masala powder along with curd and little water and cook till the oil starts to separate from the sides. Add eggs and cook for another minute. The masala should not be too dry at this stage. Wash the rice and soak in enough water for an hour. Add rice, ghee, salt, lemon juice, water and kewra essence in a pan and cover and cook till rice is 90% done. Drain the rice and layer it over the egg masala. Sprinkle saffron soaked in milk, browned onions, coriander, mint , fried almonds, cashew nuts and raisins on top. Cover the lid of the pan tightly and cook on very low heat for 10-15 minutes. Remove the lid of the pan and give the Biryani a gentle mix. When do you add the curd?